Being a technical director for a video production means turning a director's ideas into actions, requiring great accuracy and focus to create a high quality live webcast. For Morgan Gibbons, a senior communication major with a focus in electronic media at Indiana State University, it's all in a day's work. Gibbons first found her passion for the television and film industry while taking a course on fundamental visual imaging with Jeffrey Perkins, director of student video production. While in the television production course, she had been required to produce a live 60-second commercial, a three-minute newscast and a five-minute interview program. "My sophomore year, I grew to love the industry from all of the hands-on learning while in television production," said Gibbons, who is from Paris, Ill. "I had been excited to do the video production assignments while using the resources offered by the university." Gibbons took advantage of the many opportunities she had to increase her experience. Immediately after the conclusion of the course she joined Sycamore Video and became the assistant production manager. She then honed her skills directing "The Week at ISU" and "Almost Live" for campus cable channel 20. "Morgan has come a long way and is now very talented and a more patient director," said Perkins. "She knows how to think on her feet and will no doubt be very successful in the professional world. "It wasn't long before she had the chance to step into bigger roles. 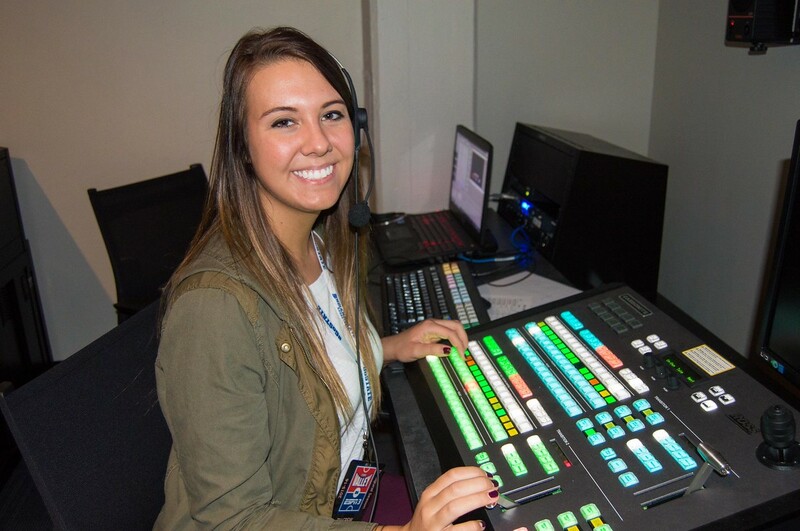 She was presented the opportunity to work for ESPN 3 on the Indiana State University campus a little over a year after she became the assistant production manager for Sycamore Video. ESPN 3 is an online streaming provider that offers live streams and replays of sports all around the globe to fans located in the United States, Australia, Brazil, Chile, the Middle East, New Zealand and Europe. "I was beyond excited about this incredible opportunity," said Gibbons. "After a few weeks I received an email congratulating me on my new job as the Technical Director for ESPN 3! I was overcome with tears of joy." The job demands a strong mindset as well as technical skills. Making mental mistakes can be damaging to the overall quality of the webcast, especially when webcasting live. It takes focus to tune out the noise of the atmosphere in order to carry out concise orders from the television director. "Her desire to learn and grow as an individual has made her transition move forward as the productions of live sports began with volleyball and transitioned into basketball," said Chris Jones, sports video manager for the Indiana State Sports Network. Gibbons' first time directing was at the Indiana State versus Illinois State women's volleyball game. She arrived at the control room, where she would be directing the game, five hours beforehand for preparation. As the director, there are many pregame task to complete. "Basketball, in comparison to other sports, is one with a much faster pace," said Seth Payne, sports video coordinator and graduate student. "You have to be able to capture your reaction shots faster, take replays faster, and make sure you keep the ball in your camera shot. You want to make sure that you don't miss any of the action for the people watching at home." While webcasting, Gibbons works with a student crew that controls graphics, the replay machine, and the video and audio boards in the control room. At the same time, other students are working as announcers, camera operators, and in other positions all located around the perimeters of the court. For everything to run smoothly she must be present in two places at once. Gibbons is one of the two technical directors. HyeIn Ko, a senior communication major and music minor from South Korea, has also been working as the technical director after being in Sycamore Video. "Some challenges that I have faced with this new position is the amount of hard work, concentration, dependability, and hours it requires," Gibbons said. "It's a lot of hard work, but at the end of the day it is completely worth it. I am so happy that I am able to participate in this amazing opportunity to learn and grow in the TV industry." According to Gibbons, the best advice for a first year college student would be to "find your passion". "Film and TV are my passion and I will never work a day in my life because I will be doing a job that I absolutely love and enjoy." Photo: https://photos.smugmug.com/Other/Media-Services/Submitted-Photos/Staff-Uploads/i-2XBnZqQ/0/X2/MorganGibbons-X2.jpg - Indiana State University student Morgan Gibbons of Paris, Ill. works as technical director for ESPN3 broadcasts of Sycamore athletic contest. Morgan Gibbons, a senior communication manager, is part of a team of students that produces broadcasts of Sycamore athletic contests.